Have you ever grown a pumpkin plant? Or a cucumber? Tomatoes? Then you know how wild these plants can be if left to their own devices. One day you have a nice little squash plant minding its own business, then seemingly overnight that nice little squash plant has completely overwhelmed the entire garden. Not only does this look messy, but it makes things a lot more difficult when you want to pick some beans and can’t even see the plants. 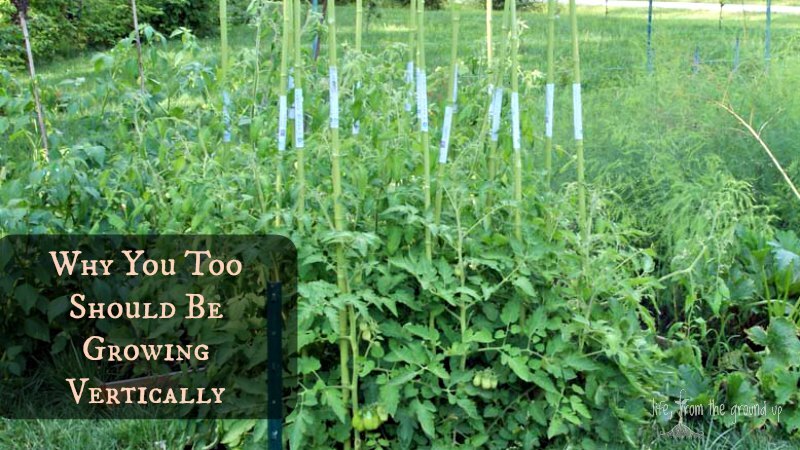 I used to garden this way and just let the plants decide how and where to grow, but when you raise a lot of vining plants (winter squash, cucumbers, tomatoes, peas…), this can get pretty ugly pretty fast. So when we moved to our new place a few years ago and I got to start with a clean garden template, I decided to try my hand at vertical gardening. I’ve changed some things along the way, but there will be no going back to the old method for me: growing vertically is here to stay, and here are a few reasons why. Unless you have a really big area to cultivate, you probably don’t want a lot of wasted space. Letting the vines sprawl takes up a lot of room in the garden, which is room that could be much better utilized for other plants. By training several cucumber plants to grow up a trellis, you’d only need a footprint of one square foot in the garden, instead of a much larger circumference they would require if they were allowed to spread out on the ground. A lot of plant diseases are caused by cramped quarters, poor air circulation, and/or exposure to moisture, all of which you’re contributing to if you let the plants sprawl. Growing them vertically allows for much better airflow and gets them up off the ground away from the wetness. I can tell you from experience that having everything up off the ground and close to eye level makes the harvest process a lot easier. No need to bend over or search through the jungle of foliage – everything is hanging right in front of you. But what exactly is required to get started? Fortunately, not much. All you need to do is to create something that will support your plants and give them room to grow. A couple considerations to keep in mind are the size of the plant and the size of the fruit that it’s producing. 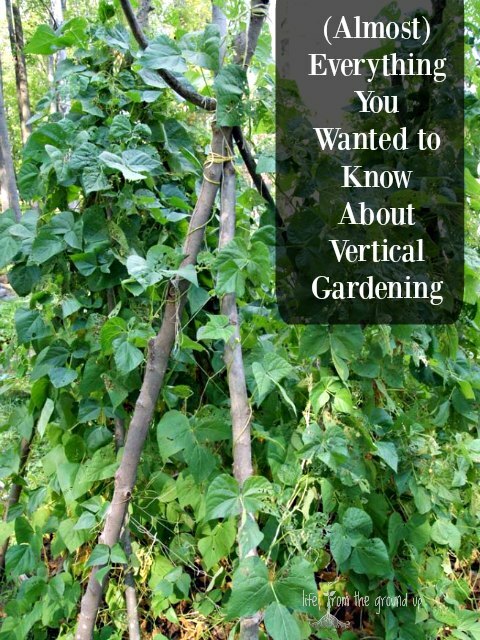 You don’t want to set up a three-foot trellis for a squash that has 12-foot vines (although you don’t need to make a 12-foot trellis either – I don’t have anything taller than 7 or 8 feet. The vines will often flop over the top or even entwine themselves and self-support.). And if you’re trying to grow the world’s biggest pumpkin, I’m afraid you won’t be able to do it vertically. I don’t know that there’s a hard cutoff for what you can and can’t grow, but I’m guessing if you’re trying something that will be 15-20 pounds or more, you may want to use extra support (I’ve seen people create a makeshift sling out of nylons or a scrap of cloth, which then gets tied to the trellis). Most of the squash I grow don’t end up more than 10 pounds, so I’ve never needed anything extra. Just about anything strong and stable enough will work, but I tend to use three main types of supports. 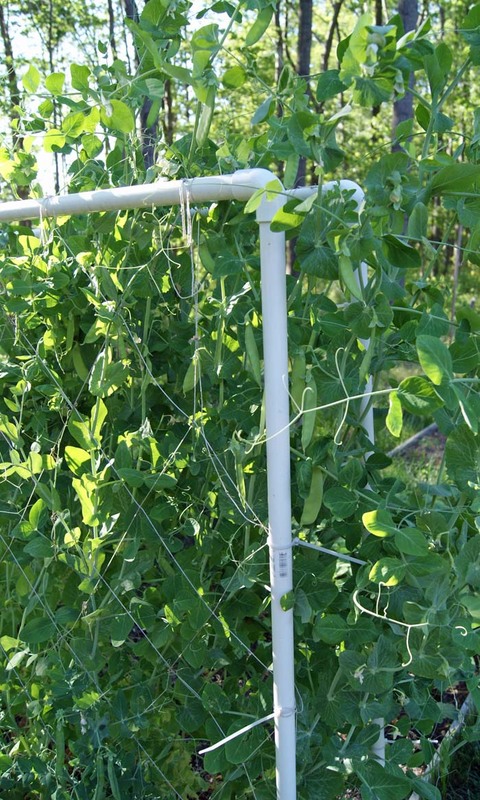 The first is a trellis made from 1″ PVC pipe with a 6″ nylon mesh stretched between, and supported by a couple feet of rebar pounded into the ground. PVC is durable, strong, and cheap (I looked at electrical conduit, but the upfront cost is a lot more), and the nylon mesh is also strong enough to support just about anything, and won’t deteriorate the way that a regular twine would. Since all my raised bed are four feet wide, the trellis is also four feet across, and usually six feet tall. I use these for most of my squash, as well as peas and cucumbers. Another easy support system I use is a modified tepee created by lashing together the tops of several sturdy branches or small trees. If you live by a wooded area, these materials should be free and plentiful, but if not, you could also use bamboo stakes. Don’t skimp and use something wimpy – I use wood that is at least a couple inches in diameter at the base, and 6-8 feet tall. Since it’s a natural material, these will probably need to be replaced periodically, but you should get at least a few good years out of each one. These tepees are primarily used for pole beans, as the beans love to wrap around as they climb. I know people who make their own cages using rolls of heavy-duty concrete wire, which I suppose probably works well, but it just seems like too much effort to me, and 50 bamboo poles take up a whole lot less room than 50 cages when they’re in off-season storage. Like I mentioned earlier though, anything that provides solid support will work. Branches, wire mesh, scrap lumber, even just a string hanging from an overhead support system. Just make sure it’s stable. The last thing you want is to go out and find that the weight of your beans has collapsed your tepee or your beautiful, heavy heirloom tomatoes have caused the stake to snap. But as long as you end up with something structurally sound, you should have a great experience with vertical gardening!